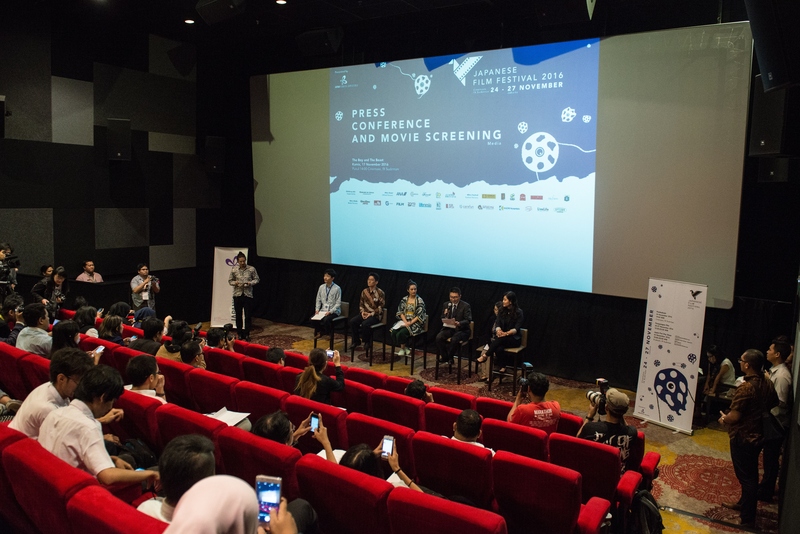 The Japan Foundation, Jakarta held a press conference of Japanese Film Festival (JFF) in Cinemaxx fX Sudirman on Thursday, November 17, 2016. This event presented Ms. Chelsea Islan as the official ambassador of JFF 2016, Mr. Ryo Nakamura as the Director of Information and Culture of Japan Embassy in Indonesia, and Norihisa Tsukamoto as the Director General of the Japan Foundation, Jakarta. Daisuke Kato as the Festival Director of JFF 2016 and Cecilia Ruslie as the representative of Cinemaxx also gave explanation about JFF on that occasion. Starting from this year, JFF Indonesia is a part of JFF Asia Pacific Initiative Gateway which is initiated by the Japan Foundation and held in 10 South East Asian countries and Australia. JFF is expected to be a bridge between Japanese films and the enthusiasts in Indonesia through holding various events related to film in particular and Japanese culture in common.